~ by Yakuza on December 3, 2011. Excellent post Yakuza (you are really destroying BOI, BIG TIME). This is what they get for downgrading 15+ films of Big B. However, I noticed alot of films that I had as Big B Hits aren’t listed in the picture file that you have. Do Anjaane, Ganga Ki Saugandh, Ral Balram, Barsaat Ki Ek Raat, Yaarana, Kaalia, Saate Pe Satta are films that were successful, but not Hits. However, I thought the films that I mentioned were Hits at the Box-Office. Is it because of the demand of Amitabh Bachchan films at that time?!? Randy, Trade guide have only five verdicts, Flop, Successful, Hit, Super hit and exceptional. 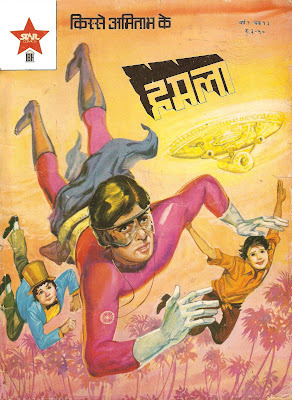 All the movies you mentioned above were big grosser, but not able to double the investment to qualify as clean Hit.And 50-60 Lakhs per territory was Super hit business at that time, and none of Amitabh movie did less than this. These were got one star verdict because of cost factor, otherwise all were silver jubilee movies, and Kaalia was quite bigger. Do Anjaane was only movie you mentioned above, which not able to put up that much big numbers for obvious reasons. And if we apply the model of these verdict system to movies now days, 90% of those so called successful or above will come out as Flops. This was purely ROI model. really amitabh was awesome in 70s and 80s,and uncomparable actor.just 5 films were short of his mark out of 57 films,its amazing,thanks YAKUZA for bringing real facts,hope u ll carry. here they are showing that Amitabh movie Ganga Jamuna Saraswati Distribution price per territory is 75 lakh and recovery is 1.50 crore per territory and also its called a flop movie so its confusing plz bro make it clear that whats the reasons that after getting double recovery and still its slop? It only claims for after that..
And in that claim they are exactly right.. I didn’t get you .. you mean they didn’t give any verdicts before 90’s ?? you can see earlier in 2003 BOI WAS 90% RIGHT IN THEIR VERDICT OF AMITABH’S MOVIES. But now they have degraded atleast 50% of amitabh’s movies boxoffice verdict.why they are not presenting the real picture? ABOVE VERDICT WERE FROM FILM INFORMATION TRADE JOURNAL MOST STRICT ONE.